How are the summer camps going? Things are going great! We did Gravity Girls Camp last week. We worked on taking drops and how to lift front wheels over obstacles. We had girl talk everyday where we talk about women in the media and women in sports and things like that. We get to have these really cool conversations. We show some videos and the girls get to talk and share what they think. We did trail work with them one day. We made jewelry out of inner tubes from flat tires so the tubes don’t end up in the landfill. This week we have Freeriders. We have a bunch of little shredders out here this week. Jumping back to the beginning, how’d you get your start in mountain biking? Back in 1987 my dad bought me my first mountain bike. He’s a big road rider and racer. He found out about mountain biking and decided to get me a bike. It was this 21-inch frame, fully rigid Specialized Rockhopper. I just had the best time on that thing. I totally fell in love with the sport. Being out in the woods, the gravity and the adrenaline, all that mixed together. I like to call it adrenalin zen and I got hooked on that pretty quick. You’re one with nature, but there’s this element of risk that makes it so much fun. I joined a mountain bike club in college. We rode around on crappy fire roads cause that’s all we knew back then. I raced a little bit of cross country as training for skiing. Eventually I got talked into trying downhill racing. Then I fell in love with mountain biking more than skiing. Kat Sweet riding in the Northwest. Photo by Karen Johanson via WTB.com. There probably weren’t many people mountain biking in 1987, let alone women. What was it like riding in those pioneering days of the sport? It was a blast. I always had fun chasing the boys around and they would give me little tips and pointers. It turned out I learned a lot of things the hard way and the wrong way. Once I started learning how to coach I had to relearn everything. I was one of the only girls, especially when I started racing downhill. In Tahoe there were maybe three of us who raced downhill in the whole field, though more and more started racing over time. Did you grow up in Tahoe? I grew up in Marin County, birthplace of mountain biking. I got my start riding on Mt. Tam [Tamalpais]. I went to school in San Diego and Colorado, so I did a little bit of mountain biking in Colorado. I took a good endo off a cliff there one time when I was first learning how to ride. I moved to Tahoe in 1991. I lived there for 10 years because I wanted to be an athlete. I was doing competitive skiing in the winter and mountain bike competitions in the summer. Did you ever come across Jacquie Phelan in the Marin days? I didn’t meet her til later. It’s funny we never crossed paths. I just met her about four years ago. She was ahead of me in the sport. These days Kat Sweet spends more time in the air than racing downhill. Photo by Meg Valliant via WTB.com. Tell me about your racing career. I know you’ve been focused primarily on gravity events. Like I said, I was talked into downhill pretty early on. I did that for a long time. I went pro for about three years at the same time I was competing in skier cross and big mountain ski competitions. I went to the XGames a few times and got to compete in France. I started doing the national NORBA races. I did really well in the expert category, but when I bumped up to Pro–honestly I look back and think, man my skills really sucked when I was racing Pro. It wasn’t until I started coaching that I really relearned how to ride. I became a much better rider later in life. When I moved up to Seattle in 2001, I started racing a little Cat 1 again. That was fun. But I got chronic fatigue syndrome and stopped racing. I took a break for three or four years. Around the same time, I was having lunch with this girl and she asked, “if you could do anything with your life, what would you do?” I said I would want to run kids bike programs. She said, “well why don’t you do it?” I thought maybe I should! I contacted Trips for Kids because there wasn’t a chapter in the area. They told me to start a chapter. I had no experience in business or nonprofits, but now I’ve been running a nonprofit for 10 years. Trips for Kids is a really cool program. They have chapters all across the US, in Israel, some in Canada. I used to volunteer for them down in California. We take inner-city kids mountain biking. Kids who have very little riding experience, let alone mountain biking experience. Some of them have never been mountain biking. Some of them have never even been in the woods before. You take them out mountain biking and oh, it’s the best thing ever. We all love it and know how amazing it is, but when you bring kids out and they experience it for the first time it’s so amazing. I started getting back into racing a little bit, but I discovered I get a lot more satisfaction from helping other people break through their boundaries than I do from racing. I like racing and it pushes me to be a better rider. But I get much more gratification from coaching and mentoring. I know coaching and mentoring is your primary gig these days. Tell me more about what you do. Trips for Kids started it. A couple years into it Cascade [Bicycle Club] was hiring a Youth Coordinator. I got hired for that. I rolled my Trips for Kids into the Cascade work for eight years. I just quite Cascade last September. They’re going through some weirdness and they canceled my Trips for Kids. I was bummed about that. I’m working to make sure it gets back up and running again. My coaching focus is kids and women. They’re my specialty. But I coach a ton of men too and co-ed classes. Tonight I had private lessons with two men. All day it was a co-ed kids camp. And in that, my specialty is freeriding. I teach people how to hit jumps and go off drops and hit berms and ride skinny bridges and all that kind of stuff. I’m able to do all this in big part because of the support of my sponsors Diamondback Bikes, Deity, Clif Bar, G-Form, Five Ten, Fox Suspension, Sombrio, and AllSport Dynamics. Mountain biking is a very male-dominated sport, though there are certainly more women mountain biking now than even a few years ago. In the Northwest there are more women, certainly. But when I go travel it’s different. Especially in the freeride world. 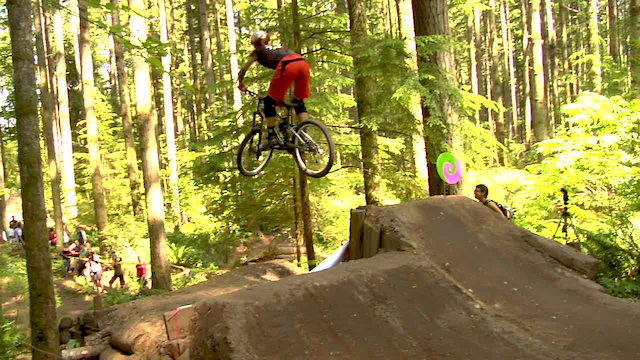 There are a ton of freeride ladies in the Pacific Northwest, especially up in British Columbia. But elsewhere there really aren’t that many jumper girls. Do you feel like there are still barriers keeping women out? Just the title of mountain biking sounds intimidating, like you’re going to go ride some giant mountain. Then you try it once and you’re like, “oh this is actually really fun.” There’s the fear factor in the beginning that intimidates some people right off the bat. Usually if they try it and try it with an instructor who can show them how to do it correctly they’ll love it. As opposed to having their boyfriend or friends say hey follow me and take them down a black diamond run first try. Then they hate mountain biking. I know a lot of people who’ve had that experience. I am seeing a growing trend of women who love the sport so much that they want to bring other women into the sport as well. I’m seeing a ton of mentorship all over the U.S. and North America. New Zealand, too. Women want to encourage other women and give them support so they can love it as much as we do. The trend is definitely going in the right direction. It’s so cool that these women don’t just want to ride, they want to get their friends into the sport too. They want more women involved. They like that sisterhood. That’s been a big piece of what I’m doing, building up the sisterhood of shred. Helping women along who want to hit the jumps and drops and wallrides. The documentary we’re making this year is called The Sisterhood of Shred. 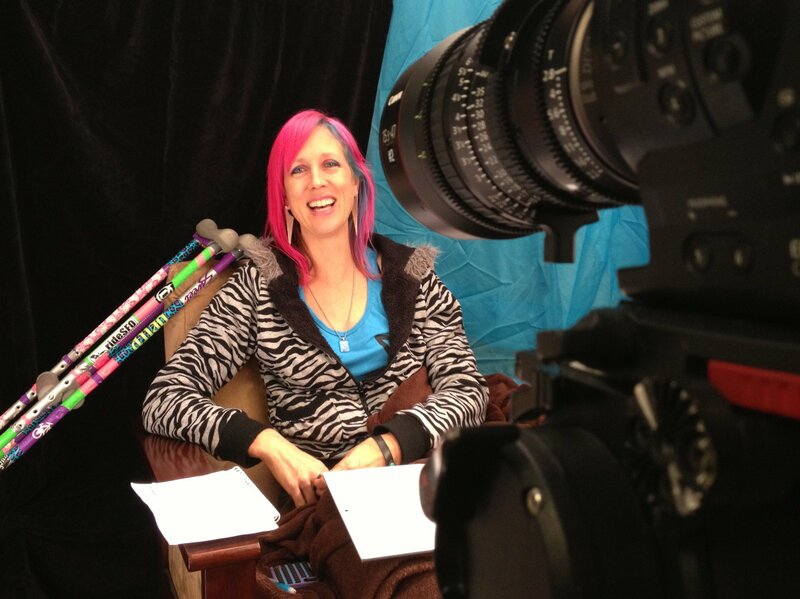 Kat Sweet filming for the Sisterhood of Shred documentary. Photo by Meg Valliant. What’s the focus of that film? My friend Meg Valliant is making the movie. It’s a documentary following the Sugar tour–my Sugar Showdown women’s jump events. She’s highlighting some of the women competing in and organizing the events. It looks at how our sisterhood gives us community and brings us together and how we’re all supporting each other along the way. And how our lives are affected by this sisterhood. It’s not just about biking. It’s about everything in life. We’re doing a Kickstarter and only have a few days left. We’re trying to raise a bunch of money. You’ve already accomplished a lot as an athlete and an educator. Where are your career goals for the foreseeable future? I definitely want to expand programs. I have some coaches I’ve been training up to run my summer programs. I have really high expectations. I want my programs to be really high, high quality: really great coaches who are really great riders who are really great at working with people. It’s a hard position to fill, but I have a really great crew working with me. I want to have an endless summer and end up back in New Zealand this winter. I want to grow the Sugar Tour and have a couple more stops on it. Then, I want to just keep growing our Sisterhood of Shred. 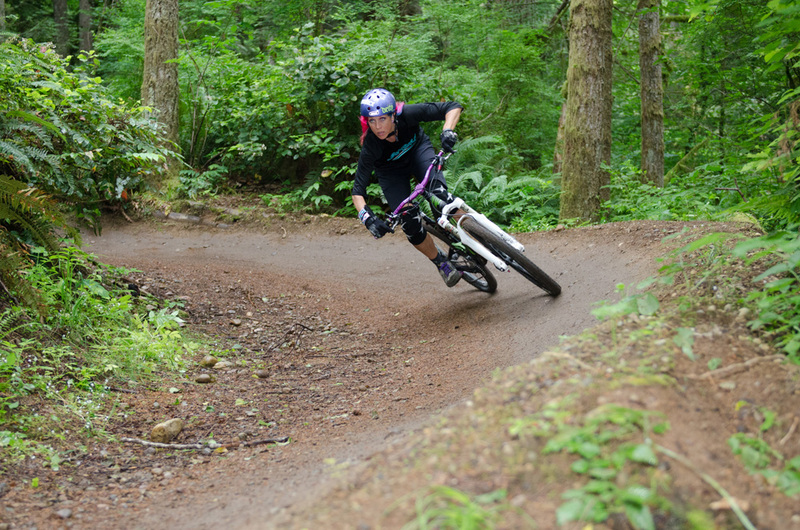 This entry was posted in History, Interviews, Mountain Biking and tagged freeride mountain biking, kat sweet, mountain bike history, northwest freeriding, sugar showdown, sweetlines, women and cycling, women mountain biking. Bookmark the permalink. Congratulations Kat! What an impressive story! I’m an old friend of your Mom & Dad. I know your Mom & Dad are very proud of what you’ve accomplished!